California’s newest national park is home to cliffs, crags, and cave formations that were formed by an ancient volcano. Shaking and quaking along the San Andreas Fault carried volcanic rocks from the eruption to their present home at this spot in the Salinas Valley. Now, millions of years later, the site is a visual and physical stunner. Follow your flashlight beam as you explore winding caves. Crane your neck to watch climbers scale the rocky pinnacles. Scan the skies for California condors, and hike among spring wildflowers. If you don't know much about Pinnacles National Park, now is a great time to get acquainted. Pinnacles is a little known gem in Central California, just 4 1/2 hours from Los Angeles. Not many people have heard about it and less have actually visited. 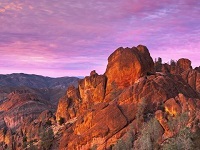 So if you are ready to rough it, join us for a camping adventure to Pinnacles National Park. We are going to be serving up some good old-fashioned home cooking. There will be plenty of hiking and relaxation. We have reserved several group campsites. The campground has flush toilets, fire ring, sinks in restroom, showers, drinking water, and picnic tables. The only gear you need that you might not have is a tent and a sleeping bag. It is going to be a fun, social, and amazing trip you will never forget! Pinnacles National Park is divided by the rock formations into East and West Divisions, connected by foot trails; no through road connects the east and west entrances to the park. The east side has shade and water, the west has high walls. The rock formations provide for spectacular pinnacles that attract rock climbers. The park features unusual talus caves that house at least 13 species of bats. Pinnacles is most often visited in spring or fall because of the intense heat during the summer. Park lands are prime habitat for prairie falcons, and are a release site for California condors that have been hatched in captivity. Pinnacles was originally established as a national monument in 1908 by President Theodore Roosevelt, and was redesignated as a national park by Congressional legislation in 2012, then signed into law by President Barack Obama on January 10, 2013. Stoke your sense of adventure during a hike through Bear Gulch Cave. Traverse a trail through the cave, making your way under limestone ledges and through tight stone passageways. As you hike, look for local wildlife, including the resident colony of bats that dwell within the cave. Bear Gulch Cave is not a typical cave. The upper and lower cave sections were formed over many thousands of years as running streams of water weathered away larger boulders, creating narrow chasms and canyons. Occasionally, larger chunks of rock broke off and landed on top of the chasms, creating the “roof” for the cave sections. The cave is home to a colony of Townsend’s big-eared bats. Look carefully and you may be able to see bats hanging in clusters inside the cave. Note that their ears resemble those of rabbits. As you explore the area, admire the views of rocky peaks and huge boulders visible from the trail. Inside the cave itself, listen for the sound of rushing water. The park's most exciting hike is the trek to the High Peaks, a series of jagged pinnacles that can be seen from miles away. The highest of the High Peaks sits at 2,720 feet/829 meters, which may not seem like much until you’re on top looking down. Though you can reach the peaks from either the east or west entrance station, the trek is shorter from the east side at Bear Gulch (6-mile/9.7-km round-trip, depending on which trail you take). Either way, you’ll climb about 1,400 feet and be amazed by the final mile of trail: a feat of very creative trail building by the Civilian Conservation Corps in the 1930s. The path wanders through a rocky labyrinth, tracing along a series of narrow passageways, and ascending over, around, and in between a maze of boulders. Handholds and footholds are blasted into the rock; steel guardrails are embedded for safety. When you reach High Peaks’ summit, look down and across at the park’s huge expanse of undulating grasslands and rock monoliths. Look up for condors too—you might be closer to them here than anywhere else in the park. Depart from Van Nuys Flyaway at 9:00am. Stop for lunch in Kettleman City. Arrive at campground around 3:00pm. Setup camp and go on short hike near campsite. Pack up and head back to Los Angeles. You may cancel 60 or more days prior to the start date and receive a full refund. Cancellation 14-59 days prior to trip start date will receive 50% refund. 0-13 days prior to trip start date will not receive any refund. If you do not show up at point of departure on time, no refund will be given. Passenger van transportation; vehicle entrance fee; three nights of camping; dinner/happy hour on Thursday, all meals Friday and Saturday plus a late breakfast on Sunday.